Let me begin by rectifying a long-held belief by some and perpetuated by others: Jesse Janzen was not an old Danish sea captain. Even though many people will say Jesse retired from the sea and ships, it was actually his father who was the captain. That being said, let’s get back to our story about the Opera House. Jesse Janzen was out of a job when the wheat industry came to an end. But in the aftermath of the 1902 fire that decimated half of Reedley’s downtown, Janzen took the opportunity to be a part of the rebuilding of Reedley. From the ashes of the former Reedley Hardware Company, rose a fine, two-story brick building that took up the entire corner from 10th and G streets to the alley. The building was built of bricks made in Reedley and housed two business “firsts” for Reedley: the Jansen Opera House and the First State Bank. According to a 1968 article written by G.A. “Gus” Reimer, the building had 9000 square feet of space. The entrance was on 10th Street, with a ticket-booth just inside the entry doors. The full basement served as dressing rooms for the actors and store rooms. “It was the very center of a great deal of Reedley’s early history,” wrote Reimer. 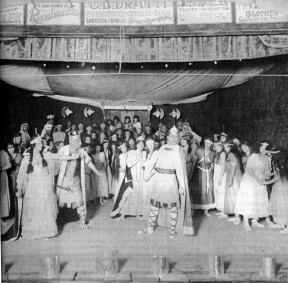 From the very beginning, the Opera House was a hive of community activities. Traveling theater groups now stopped in Reedley, bringing professional entertainment all the way from San Francisco. During some of the theater performances, Hank Rasmussen and his buddies would stand on crates in the alley and peer through the windows, trying to get a good look at the actresses. Reedley High School didn’t have an auditorium or a gymnasium at the time, so class plays, graduation exercises, dances and even basketball games all took place at the Opera House. Among those early high school graduates was Edna Parkinson. C.F. Mueller had the starring role in a community play Queen Esther. Perhaps the most controversial play ever performed in the Opera House was Uncle Tom’s Cabin. The annual Fireman’s ball was held there, and many early churches used the building for Sunday services before their own church buildings were built. By the 1920s, the bank had already moved to another location and the post office was occupying the corner of 10th and G streets. The high school had an auditorium and gym, so there was no longer a need for a community meeting place. Live entertainment basically dwindled away with the advent of movie theaters, especially “the talkies.” In order to compete for the entertainment dollar, boxing and wrestling matches were added to the venue. These matches featured local boxers Jim Sorenson and Bozo Aalto, as well as professional wrestler, Ali Baba from Sultana. Dale Drake opened a small bore pistol range in the basement. In 1940, the new post office was opened on 11th and E streets and the Fresno County Free Library moved into the corner location. The library stayed until the new county building was erected in the early 1950s. During this time, the once grand Opera House became a warehouse for the feed store that was located next to Penner Bros. auto parts. For a very short time, Sears operated a catalog store from the corner before relocating down the street. Other tenants came and went. Sadly the building began to show her age and was destined for demolition. Reimer visited the old building during this time. “As I went there and looked at the scarred walls where fancy pilasters were once attached, and walked the worn floor where thousands of others now long gone, walked and stomped…I almost heard the laughter and the applause of the audience.” It looked like the once fanciful painted stage curtain was going to stay down forever. Local newspaperman Budd Brockett pleaded for someone to come forth and save this historic building from the wrecking ball. In 1975, angels of mercy in the form of Art and Pat Bergthold, Carol Just, and Max and Ruth Hase appeared with a plan to save the Opera House building complex. While Just and the Hases took on the restoration of the former bank and office complex, the Bergtholds took on the project of restoring the Opera House to its former turn-of-the century glory. According to Pat, she and Art thoroughly researched historic building restoration and visited many other old opera houses throughout the United States. They wanted Reedley’s opera house to be authentic in every way. The building is on the National Register of Historic Places. 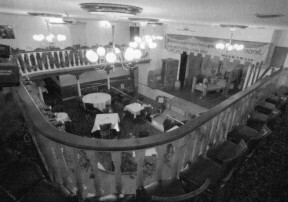 The renovation took some time, but the new “Turn of the Century Corner” was opened for business in 1984. Initially there were shops occupying the corner, and the Opera House Restaurant served specialty German Mennonite dishes. There was live entertainment that ran the gamut from Gilbert and Sullivan operettas to jazz. There was also a sandwich shop and ice cream parlor in the back of the theater. The location of the Reedley Museum right next door and the quaint downtown shops including the Mennonite Quilting Center, all made Reedley a popular stop for tourists on the way to the national parks. Even the I Street Corridor Project was originally designed to entice visitors to historic downtown Reedley through a gateway arch at 11th and I streets. Interestingly, the consultants that developed the I Street Corridor design, saw the Peloian building and the Granger Warehouse as the bookends that would anchor downtown commerce. As the Bergtholds began looking toward retirement, they worried about what would happen to the building. There was a buyer in the wings, but Pat says she and Art thought it would be best if the Reedley Opera House stayed in the hands of local people. 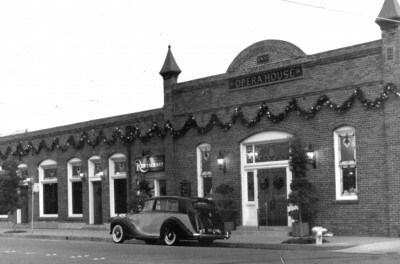 In 2000, they gift deeded the Opera House to the City of Reedley. The River City Theater Company now leases the building from the City. People from all over the valley come to see the talented company perform. Under the artistic direction of Mark Norwood, the old stage is once again filled with talent and the theatre resounds with the applause of appreciative audiences. A word of warning here. With the recent demolition of the Granger Warehouse, and the annual discourse in the ranks of the city council over the high cost of maintenance for the building, could the whole concept of Reedley’s historic crown jewel–The Reedley Opera House–be in jeopardy? A people who take no pride in the noble achievements of remote ancestors will never achieve anything worthy to be remembered with pride by remote descendants. Thank you for this article. I love history and enjoy learning about our town’s past. I hope that the past will have a place in the future of those who continue to dwell here in our little spot of paradise. So many buildings and so much history has been lost in my (relatively short) lifetime. Thank you for bringing stories like this to the public.